I like dicking about with MS Paint. I like that I can a make a false image and have it look really shody and fake, that really pleases me. I've demonstrated on here in the past with licence I designed for the Licence to Kill post and the picture of Anne Boleyn playing football. Here are a few other examples of my mad paint skills from the past year or so. 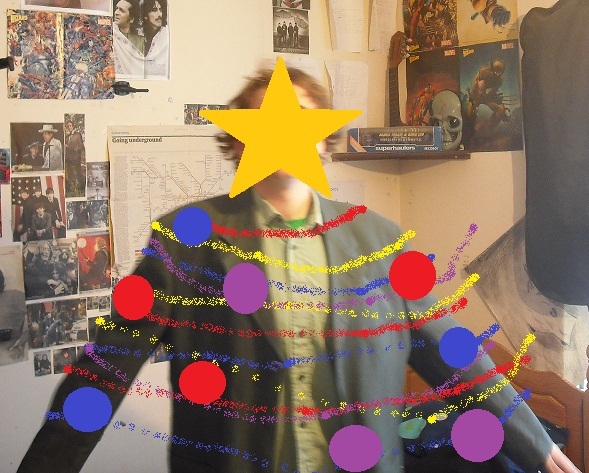 1) For Christmas I put on my green jacket, posed as a Christmas tree, then added the decorations in paint afterwards. 2) For my friends 20th birthday I put his face onto every face on the cover of Sgt. 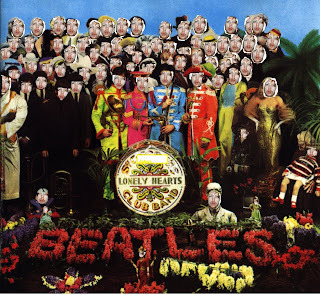 Peppers. Partly because the first line is "It was twenty years ago today" and party because it is quite funny. 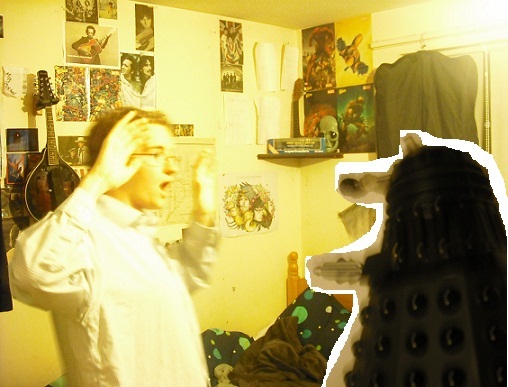 3) Seeing as I have a toy dalek I thought it would be cool to get a picture of it threatening me. So I took a picture with surrendering on one side, then I took a close up of the dalek in the correct position, then I seamlessly patched the two images together. 4) These last two aren't strictly paint but anyway. When Facebook started allowing you to have a cover at the top of the page it didn't take me long to come up with this. 5) Along similar lines, on Google + you can have several small pictures instead of one big one. So I made it look like I have a really long arm and a massive hand. As you can tell from the colour of the wall behind, these are three separate images and the one of my hand is really a flipped picture of my right hand. If you have any requests for things I could make in paint, please let me know.